One of the most enjoyable aspects of vacationing in Europe is staying in a country home. The fresh air, picturesque landscapes and relaxing vibes all contribute to a memorable family holiday. And for residents of Shanghai, Suzhou, Ningbo or Hangzhou, the same experience is now only a drive away. Husband and wife owners Christophe and Pauline Peres fell in love with the hills of Mogan Mountain 10 years ago. Their primary residence is in downtown Shanghai, and they wanted a place where their three young boys could roam freely surrounded by nature. 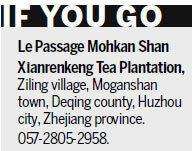 On a drive north of Hangzhou, they discovered an idyllic spot: A tea plantation nestled in the greenery of Deqing county. Peres, a French developer who specializes in converting Art Deco buildings in the former French concession, was determined to make the plantation his family's vacation home. After purchasing the land, Peres set about master planning, designing and building his dream French country house to exacting standards. "I collected and reclaimed wood, which I used throughout the house. I like the look and feel of soft leather chairs," Peres says. "He built everything a little too well," Pauline Peres, an English-born Chinese with Hong Kong roots, says, laughing. The couple discovered that Mogan Mountain was a popular holiday destination for Shanghai's elite in the 1930s. The cool mountain air and beautiful rolling hills provided a welcome contrast to humid summers in the city. Today, there are many houses in the county that have been converted into cottage industries specializing in local handicrafts. Peres' tea-plantation conversion took eight years. In 2008, right in the middle of the process, the government approached the couple to see if they would be interested in turning their home into a luxury boutique hotel. That change resulted in the gradual addition of five independent villas to supplement the main building. There are a total of 29 spacious rooms, with some boasting terraces and others spanning two levels. Outfitted with painted wrought-iron chandeliers, weathered hardwood flooring and European-style country furnishings, the accommodations are luxurious while remaining family-friendly. The facilities include a heated outdoor saltwater swimming pool and a number of areas for dining, such as a poolside restaurant and fine-dining restaurant helmed by executive chef Jackie Chan. Peres is a wine buff and stocks a large cellar featuring small organic vineyards and biodynamic vintages. Wine pairing dinners can also be prepared for up to 40 guests in the cellar. The average stay is three nights, Peres says. "We want to give (guests) the option of dining in different places on the property, including in their room." Since it opened in October 2012, Le Passage has become popular for MICE (meetings, incentives, conferences and exhibitions), such as corporate retreats, incentive trips and outdoor weddings. The entire hotel can be booked for a large family or company gathering, Peres says. Le Passage has a cooking school where guests can learn French cuisine from the basics to gourmet dishes. "We package the results of their cooking so that guests can take treats like foie gras home to share," says Peres. As Le Passage is a working tea plantation, guests can pick tea leaves when in season and learn how to make tea as well as purchase organic brews from its boutique. Other popular activities include rose picking from its 12,000 rose bushes and floral arranging. There are extensive trails in the surrounding countryside for hiking and bike riding, with bicycles supplied by Le Passage, and two golf clubs nearby. 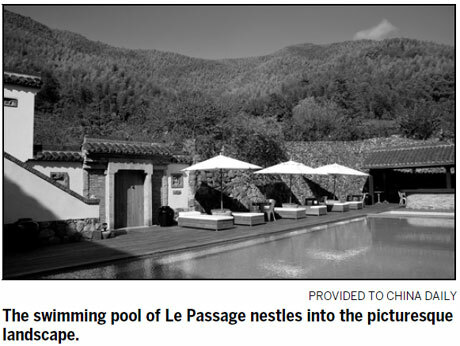 "Le Passage is a destination for people to enjoy nature but don't want to rough it," says Pauline Peres. "Even if they are just coming up for the day, we will plan their activities. We take care of everything for them."